Last week, I thought i better go & deliver the Best Live Band AIM award i collected for @babymetal_official. This pic was after they had just peformed two sold out 55,000 capacity stadium shows. As you do ! One of the biggest stages ive seen, including a b-stage 100 ft in the air. Every punter given a neck brace that lit up, and just an awesome performance from the girls and the Kami Band. Two shows i wont forget anytime soon. Next stop RHCP UK tour in Dec. Rock ! Congratulations to @BABYMETAL_JAPAN and the kami band tearing up the TOKYO DOME 2 nights in a row!! KAI-YOU.net | POP is Here . Soal musisi, Jepang memang tidak ada matinya. Kini, BABYMETAL gelar Live Viewing untuk mengenang serunya konser tersebut. BABYMETAL’s KOBAMETAL Speaks — Kerrang! J-pop/metal group Babymetal is getting a live-action/animated hybrid series from WB’s digital studio. Japanese pop-metal group Babymetal have been met with their fair share of derision, but their popularity seems to only be growing. Now, a new digital hybrid live-action/animated action-adventure series is in production based around the band’s adventures “inside the magical world of heavy metal music as it comes under attack,” according to Deadline. The series will feature brand-new live-action performances from Babymetal opposite an animated storyline, which the members will enter “through a secret portal.” The series is being produced by Warner Bros’ digital outlet Blue Ribbon Content and Japan’s Amuse Inc. subsidiary Amuse USA, alongside Babymetal manager Key Kobayashi. The series is being aimed at US audiences. Dengan serial itu, Warner Bros. mencoba mengenalkan fenomena Babymetal dari Jepang ke penonton di Amerika Serikat. BABYMETAL will star in their own Warner Bros animated show as they prepare to support Red Hot Chili Peppers on their UK tour. Babymetal bohaterkami kreskówki: Gwiazdy staną w obronie heavy metalu w produkcji Warner Bros! Powstanie kreskówka, której głównymi bohaterkami będą Babymetal! Warner Bros. podpisał z japońskimi gwiazdami kontrakt na animowany serial, który zapowiada się bardzo ciekawie. Babymetal set to appear in new anime series debuting in the U.S.! Wokalistki metalowego zespołu zostaną bohaterkami nowej przygodowej serii wytwórni Warner Bros. The Japanese metal band BABYMETAL was confirmed to have landed their own anime series. 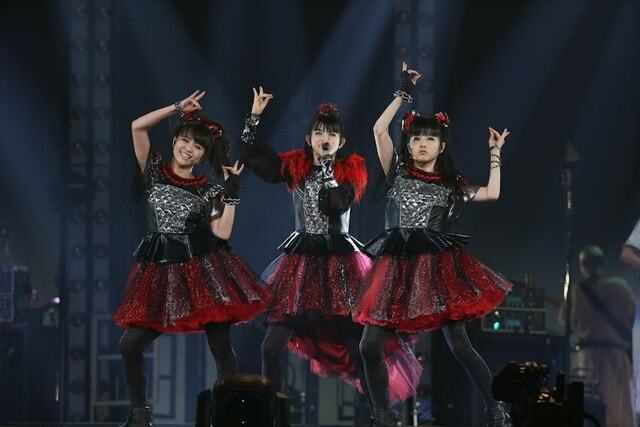 BABYMETAL performed on a sold out show at SSE Arean, Wembley in London earlier this spring.